The Galileans take their name from Galileo Galilee, the famous Italian astronomer who discovered them between January 7th and 13th, 1610. Using his improved telescope, which he designed himself, he observed what he described at the time as “three fixed stars, totally invisible by their smallness”. All three of these luminous objects were close to Jupiter, and lay on a straight line through it. Subsequent observations showed that these “stars” changed position relative to Jupiter, and in a way that was inexplicable as far as the behavior of stars was concerned. On January 10th, Galileo noted that one of them had disappeared, an observation which he attributed to it being hidden behind Jupiter. Within a few days, he concluded that they were orbiting Jupiter and were in fact moons. By January 13th, he had discovered a fourth moon, and named them the Medicean stars, in honor of his future patron – Cosimo II de’ Medici, Grand Duke of Tuscany – and his three brothers. However, Simon Marius – a German astronomer who also claimed to have found these four moons – prescribed the names Io, Europa, Ganymede and Callisto (after Zeus’ lovers in the Greek mythology) in 1614. While these names fell out of favor for many centuries, they became commonplace by the 20th century. Together, they also became known as the Galileans, in honor of their discoverer. The innermost is Io, which is named after a priestess of Hera who became Zeus’ lover. With a diameter of 3,642 kilometers, it is the fourth-largest moon in the Solar System. With over 400 active volcanoes, it is also the most geologically active object in the Solar System. Its surface is dotted with over 100 mountains, some of which are taller than Earth’s Mount Everest. Unlike most satellites in the outer Solar System (which are covered with ice), Io is mainly composed of silicate rock surrounding a molten iron or iron sulfide core. Io has an extremely thin atmosphere made up mostly of sulfur dioxide (SO2). The second innermost Galilean moon is Europa, which takes its name from the mythical Phoenician noblewoman who was courted by Zeus and became the queen of Crete. At 3121.6 kilometers in diameter, it is the smallest of the Galileans, and slightly smaller than the Moon. Europa’s surface consists of a layer of water surrounding the mantle which is thought to be 100 kilometers thick. The uppermost section is solid ice, while the bottom is believed to be liquid water, which is made warm due to heat energy and tidal flexing. If true, then it is possible that extraterrestrial life could exist within this subsurface ocean, perhaps near a series of deep-ocean hydrothermal vents. The surface of Europa is also one of the smoothest in the Solar System, a fact which supports the idea of liquid water existing beneath the surface. The lack of craters on the surface is attributed to the surface being young and tectonically active. Europa is primarily made of silicate rock and likely has an iron core, and a tenuous atmosphere composed primarily of oxygen. Next up is Ganymede. At 5262.4 kilometers in diameter, Ganymede is the largest moon in the Solar System. While it is larger than the planet Mercury, the fact that it is an icy world means that it has only half of Mercury’s mass. It is also the only satellite in the Solar System known to possess a magnetosphere, likely created through convection within the liquid iron core. Ganymede is composed primarily of silicate rock and water ice, and a salt-water ocean is believed to exist nearly 200 km below Ganymede’s surface – though Europa remains the most likely candidate for this. Ganymede has a high number of craters, most of which are now covered in ice, and boasts a thin oxygen atmosphere that includes O, O2, and possibly O3 (ozone), and some atomic hydrogen. Callisto is the fourth and farthest Galilean moon. At 4820.6 kilometers in diameter, it is also the second largest of the Galileans and third largest moon in the Solar System. Callisto is named after the daughter of the Arkadian King, Lykaon, and a hunting companion of the goddess Artemis. Composed of approximately equal amounts of rock and ices, it is the least dense of the Galileans, and investigations have revealed that Callisto may also have a subsurface ocean at depths greater than 100 kilometers from the surface. Callisto is also one of the most heavily cratered satellites in the Solar System – the greatest of which the 3000 km wide basin known as Valhalla. It is surrounded by an extremely thin atmosphere composed of carbon dioxide and probably molecular oxygen. Callisto has long been considered the most suitable place for a human base for future exploration of the Jupiter system since it is furthest from the intense radiation of Jupiter. Needless to say, the discovery of the Galilean moons caused quite a stir for astronomers. At the time, scientists still believed that all of the heavenly bodies revolved around the Earth, a belief that was consistent with Aristotelian astronomy and Biblical canon. Knowing that another planet could itself have bodies orbiting it was nothing short of revolutionary, and helped Galileo to argue the Copernican model of the universe (aka. Heliocentrism, where the Earth and other planets revolved around the Sun). If you’re interested in learning more about Jupiter and its moons, you should also check out Jupiter’s moons and rings and Jupiter’s largest moons. 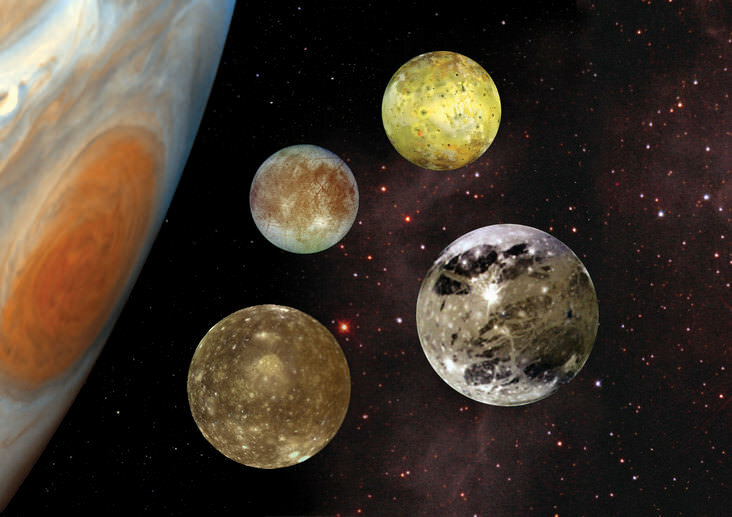 Universe Today has many interesting articles on Jupiter’s largest moon and Jupiter moons. For more information, try Jupiter’s moons and Jupiter. Astronomy Cast has an article on Jupiter’s moons. Mr Williams, this comment is intended as (about) much as constructive criticism as just ripping. While reading your article “A Universe of 10 Dimensions” I noticed some careless errors that, to me, don’t befit writers in general and certainly not writers for science oriented websites. Everyone makes mistakes, but perhaps you’d want to be wary of these in future writings. Previous PostPrevious What are the Different Types of Renewable Energy?